Save $500 to $1,000 per couple off this river cruise. Expires April 30. Click here for eligible departures. Arrive in Zurich and check in to your hotel. Grand cities blend in perfect harmony with their historic past and their progressive future. Zurich’s medieval houses, narrow lanes and town halls from the Renaissance period offer a striking backdrop to its trendy and ultra-modern metropolis. And Amsterdam’s Golden Age melds seamlessly with its lively cafés, exciting nightlife and glorious museums. Inspirational towns have given way to great stories, poetry and music—Heidelberg, where Mark Twain wrote “A Tramp Abroad.” Timeless traditions remain intact—from the making of Kölsch, Cologne’s legendary brew to the making of Rüdesheimer Coffee. 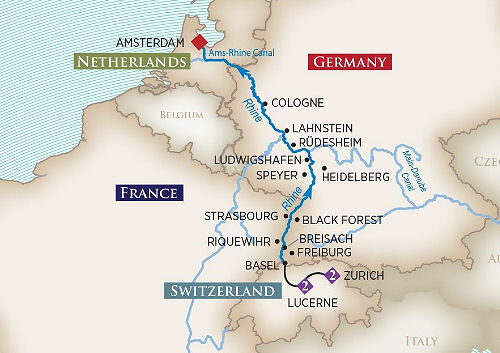 Take a front-row seat on an enchanting journey that takes you along the Rhine and through its designated-UNESCO World Heritage Site with its 40 castles strung like pearls on its river banks and to magnificent cities and charming villages alike. Single Supplement for Cruise: 50% of twin price; Suites 100% of twin price. Single Supplement for Land: A single supplement charge will be applied to pre- and post-cruise hotel extensions.